Our System May be What you have been Looking for!! Every small business needs capital to grow. Raising money is time consuming and involves special skills and knowledge. A funding strategy is a plan to obtain needed funding. Depending on your stage of business and the potential of your small business, funding may include small business loans, private equity or institutional funding. Ultimately, our goal is to build an effective Private Equity Campaign strategy for you. A business plan alone will not attract capital because it does not create an investment opportunity for potential investors, nor does it compel a bank to lend you money. Before you pursue growth capital, you should have a business plan that charts your path to profitability so you know how much capital you will need for each stage of your business. We have different types of events we host regularly to connect qualified companies to capital. (To learn about our planned events click here, to learn about our past events and progress, click here) We will also arrange individual and group meetings with investors and lenders for our clients who are under a Private Equity Campaign. It is important to understand that capital is not attracted through one event or one meeting or one email....if you do attract capital, it will happen after talking to many, many potential investors and spending time with many interested investors, and you find those through very specific intent to identify and engage those investors. That happens over at least a 3 month period of time. At the end of 3 months, you should have had serious discussions with some investors and may even have closed on some investment capital. You will know you are on the right track and need to continue on with a few tweaks. If you haven't gotten "traction" with the investor community, then you will need to retrench and regroup and figure out what is missing in your business model or structure or offering. Our system begins with the end in mind. Entrepreneurs must understand the process of raising money. 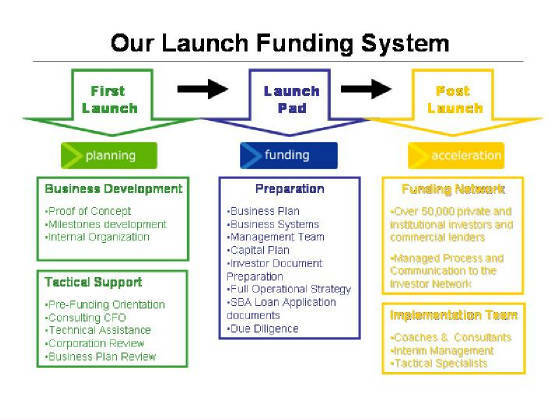 For the business development phase, First Launch, prepares your business to pursue funding. For the pre-money phase, Launch Pad ensures you understand the expectations of potential investors, develops your strategic plan and coaches you on investor presentations. Companies that try and fail to raise money often undervalue the importance of pre-money preparation. The fundraising period consists of presenting your investment opportunity to qualified individual or corporate investors, and following through to obtain the funds you seek. The Launch Funding Network includes many different types of banks, alternative lenders, private investors, angel groups, institutional investors, and access to public markets. LAUNCHfn does not stop there, though. To be truly successful, entrepreneurs must be able to execute the plans they have put in place. We all know of companies that received money, but still failed. Why? They didn't have a plan, a blue print to scale and execute. The most dangerous period for a company is the first 90 days after funding....it is critical to make sure the company gets on the right track fast and doesn't get bogged down in operational details that are not critical to the sales and revenues target they have set and can better handled by an outsourced resource. Successful entrepreneurs have a coach and a team to help keep them on track. Through our Post Launch service team, we become part of your team, from the beginning to the end when you return value to your investors. Some clients can do a lot of work themselves under the supervision of LAUNCHfn staff. Other clients are lightly staffed and hire LAUNCHfn as a full service firm. Descriptions of the most popular small business services offered in each of these areas of the LAUNCHfn system can be found in the services section. While our system to plan, fund and accelerate your business is superior to others in the marketplace, it is not for everyone. If you can say “YES” to these 3 questions, then LAUNCHfn is the right partner for you as you take your business to the next level. 1. Is your company an emerging growth company, with the ability to expand regionally, nationally or globally? 2. Are you coach able, with the desire and ability to follow instructions, advice and guidance to increase your success? 3. Are you ready now to make the commitment of time and money required to develop needed relationships with investors? Our systematic process and infrastructure ensure the overall success and development of a compelling business plan and strategy, entrepreneurial management support and development, and capital funding resources based on operational requirements and a practical business revenue model. The Business Assessment may reveal you have all you need and that is EXCELLENT! You can fast path to the Funding Network. BUT, if you have something that will keep you from getting funding, isn't it better to address it first before you spend time and money pursuing investors only to be rejected? The process moves an entrepreneur through educational development programs, business plan development, financial analysis and projections, preparation of investment documents and presentation material, management development, business system and process development and with the ability to ‘incubate’ business models secured by equity investments by LAUNCHfn and the investment community. LAUNCHfn will save you time and money in starting your business and in growing your business. From online workshops to customized package of services tailored to the needs of your business, LAUNCHfn is committed to helping you be successful and for your business to reach its full potential. We have a comprehensive network of early stage and late stage investors and lenders that are eager to find good companies to finance. If you have a unique service or offering, you can join our alliance. We are always looking for the best and the brightest to engage when our clients have a specific need. Please contact us (link below) and use the comment section to send us a brief description of your services and the names of some clients you have served. The challenge most investors face in the current market is not enough qualified deal flow. There are many start-up companies, but they do not have the proper documentation for receiving an investment, or they may have a gap in their "go to market" strategy. If you are actively seeking projects to review for consideration of an investment, please let us know your preferences. Please visit our Investors Only section to complete a profile and join the Launch Funding Network. Additionally, we can build a team to specifically review and screen deals for your investment criteria.